A regular blog covering tips and tricks, helping you to get the most out of Jim2 Business Engine, whether it be by learning about new features or saying hello to existing ones. This month on Happen Insights we’ll continue looking at collecting payments, focusing on payment terms, statements and trading in multiple currencies, and we'll also give you some handy hints to help you navigate the Jim2 Help file like a pro. Let’s carry on from last month with payments and statements. When invoicing customers, check your payment terms are set up correctly in your Jim2 database, and that the customers have the correct payment terms selected on their CardFiles. Payment terms are used to work out when an invoice is due for payment. Bonus tips: To get a sale over the line, why not offer customers extended payment terms, by a week for one-off large volume sales. You can override the payment due date at point of invoicing for these sales. Or, why not move the non-regular ’30 DAY’ customers to a ‘Seven day courtesy account’. This makes it easier for you to chase payment and implies you are doing them a favour. You can save time and money by emailing statements, rather than posting them. You can set customers to ‘Statement via Email’ via their CardFile. You can even direct statements and invoices to a specific email address to ensure they get into the right hands for payment. Fact: Mailing one statement costs at least a dollar, maybe closer to two if you include your labour. If you’re posting 500 per month you’ll add $6000 per year to your bottom line. So email them where possible! Remember, pressing F6 will shortcut to invoice. Traditionally statements are sent once a month, but with email it doesn’t need to be that way. You’ll be surprised how often people pay ‘on statement’ so why not try having different statement cycles for different customers? A number of our customers send different formats of statements in different cycles. For customers on credit hold, remind them of the outstanding balance by emailing statements more often, perhaps weekly to collect their payment. This can easily be done by filtering your outstanding debtors based on their credit hold status or payment terms. Story: A regional customer of ours was in a bit of a cash flow crunch, so decided to email statements mid-month to everyone over 30 days. As a direct result over $150,000 came in weeks before normal. Crazy as it sounds, a lot of people simply pay on statement. Working with multicurrency debtor and creditor accounts can be difficult for administrators. Not with Jim2. You only require one CardFile, irrespective of what currency the sales or purchases are traded. Debtor/Creditor displays the various foreign currency values, as well as the home currency value, all under the one account. With one CardFile, how do you keep tabs of currencies? You can select a preferred ‘default’ currency for each customer or vendor to assist with accurate transaction entry on their CardFile. Jim2 displays the foreign currency value, as well as the home currency value, in all sales and purchases. What’s nice about this feature is that the ‘credit limit’ functionality in Jim2 operates on multicurrency accounts and you can control credit limits on these accounts. 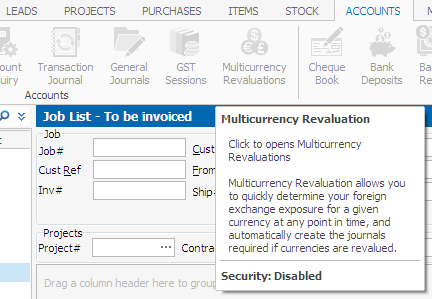 Also, revaluation sessions can be added to view exposure on multicurrency accounts. The Jim2 help file houses a wealth of information, and we’ve dedicated a huge amount of effort into reinvigorating the look and feel of the library to make sure it’s informative and easy to navigate. While there is a search function available, it isn’t necessarily the fastest way to find what you’re after and doesn’t always locate the desired information based on your entry. With these quick tips you can fast-track past trawling through search results and cut down the time it takes to find what you’re really after. 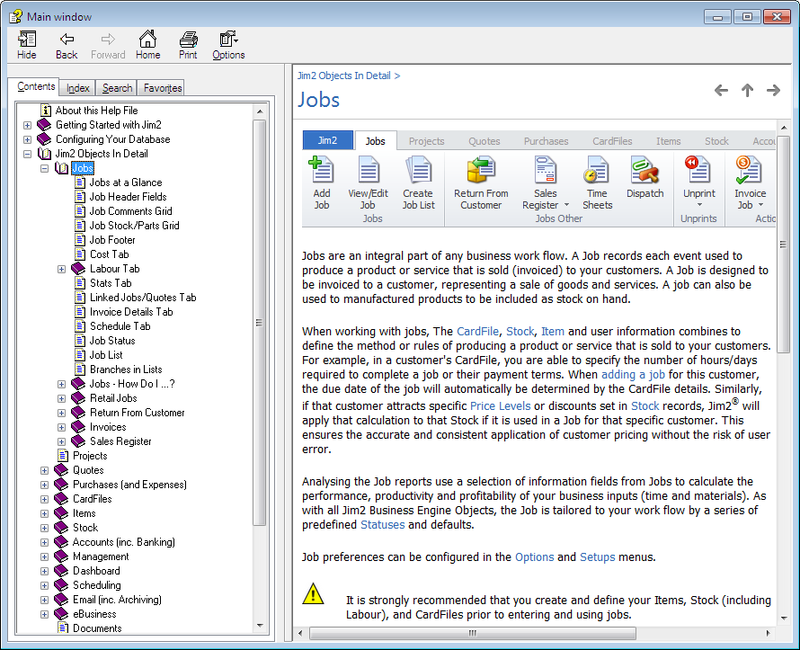 Access the help file (select F1), from the actual area in Jim2 that your question arises. Jim2 help file has a little background information and context to direct you to the chapter related to your query. For example, not sure how to add a new contact? Whilst you have a CardFile open, select F1. The help file will bring you to the CardFile topic. Narrow down the search by checking the sub topics of the help file menu. In each chapter you’ll find a ‘How do I…?’ section leading you through more specific tasks. Our About this Help File page always includes a publishing date, helping you to uncover how recent your information is. With each new software update we ensure the latest help file is included and readily available to help you out. Remember software upgrades are FREE to all Jim2 clients. If there’s a Jim2 process not covered in the Help file, please be sure to bring it to our attention. We want the help file to remain a useful resource, and chances are if you can’t find an answer, neither can anyone else asking the very same question. Screen tips: Hover a cursor over Jim2’s icons to find out a little extra about these functions. There are over 200 tips available in Jim2 and the part we love is they highlight more than just the basics, as well as indicating why you can’t access greyed out section. Please feel free to share Happen Insights with others in your organisation. We'd love your feedback as to any topics you wish to see in future editions. Please forward your suggestions to ideas@happen.biz, or leave a comment on the related blog article. Bonus tip: Software updates are FREE with your subscription. Make sure you have the latest version now and be ready to move to Version 4.0 with Full Document Management. *Multicurrency is optional. Contact your Account Manager to add multicurrency functionality to Jim2.